1. This offer is open to legal residents of the 50 United States, the District of Columbia, and Puerto Rico making purchases in participating retail stores in those locations. This offer is not transferable and is valid only for the individual who purchased four new qualifying Cooper tires in a single transaction for personal household use. Void where restricted or prohibited by law. 2. Properly submitted and verified claims will be provided with the reward (as described below) in U.S. dollars in the form of either a (i) Cooper Tires Visa® Prepaid Card to be mailed to the address provided on this official form or (ii) Cooper Tires Prepaid Mastercard® Virtual Account to be emailed to the email address provided on this official form, as selected on the official form. If no selection is indicated, a Cooper Tire Visa® Prepaid Card will be issued. Visa Prepaid Card is issued by MetaBank®, Member FDIC, pursuant to a license from Visa U.S.A. Inc. Card can be used everywhere Visa debit cards are accepted. Prepaid Mastercard Virtual Account is issued by MetaBank, Member FDIC, pursuant to license by Mastercard International Incorporated. Mastercard is a registered trademark, and the circles design is a trademark of Mastercard International Incorporated. Virtual Account can be used at every internet, mail and/or telephone merchant everywhere Debit Mastercard is accepted. No cash access or recurring payments. Pay close attention to the expiration date of the Prepaid Card. Card/virtual account valid for up to 6 months; unused funds will be forfeited at midnight Eastern Time the last day of the month of the valid thru date. Terms and conditions apply, see MyPrepaidCenter.com/site/visa-promo for Cooper Tires Visa® Prepaid Card or MyPrepaidCenter.com/site/Mastercard-virtual for Cooper Tires Prepaid Mastercard® Virtual Account. Failure to activate or use your card/ virtual account will void the offer and relieve Cooper Tire & Rubber Company (“Sponsor”) of any further obligation. Lost, unused, or unused balances on cards/virtual accounts will not be replaced after the expiration date. The card/virtual account is subject to the terms and conditions placed on it by its issuer. Sponsor reserves the right to substitute an alternative reward of equal or greater value. 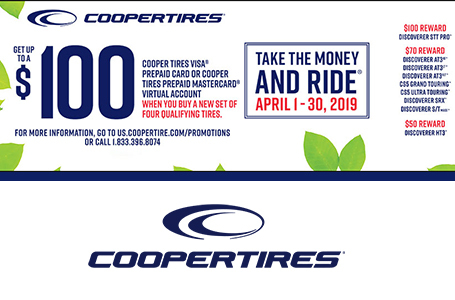 3.This offer is contingent on the purchase of a new set of four qualifying Cooper tires (in a single transaction) from April 1, 2019 through April 30, 2019. Reward requests must be postmarked or submitted online no later than May 30, 2019 and received no later than June 15, 2019. Late submissions will not be accepted. Allow 6 to 8 weeks after Sponsor receives the request for delivery of the card/virtual account. 4. Reward Amount: Actual reward amount depends on the qualifying tires purchased and the availability of qualifying new tires at the time of purchase. $50 reward is available for the purchase of the following qualifying tires: Cooper Discoverer HT3™, Cooper Discoverer HTP™** tires. $60 reward is available for the purchase of the following qualifying tires: Cooper Adventurer A/T™**, Cooper Adventurer H/T™**, Cooper Adventurer Tour™** tires. $70 reward is available for the purchase of the following qualifying tires: Cooper CS5 Grand Touring™, Cooper CS5 Ultra Touring™, Cooper Discoverer AT3 4S™, Cooper Discoverer AT3 LT™, Cooper Discoverer AT3 XLT™, Cooper Discoverer ATP™**, Cooper Discoverer RTX™**, Cooper Discoverer SRX™, Cooper Discoverer S/TMaxx™ tires. $100 reward is available for the purchase of the following qualifying tires: Cooper Discoverer STT Pro™. Substitutions are not eligible. ** Available at select national retailers only. 5. Limit of one reward per new set of four qualifying tires purchased in a single transaction. Purchases must be for household use, and offer is limited to two claims per person, family, household, email or address. 6.Requests from groups, organizations or businesses will not be accepted. Offer is not available to the affiliated dealers of Sponsor, their respective owners and employees or immediate family members of such owners or employees. Offer not valid for business or fleet vehicles. Purchaser is responsible for all applicable taxes and other fees. This offer may not be combined with any other offers from Sponsor. 7. Apply for your reward online or via mail. This offer is not transferable, so the name on the application form must match the name on the sales receipt. (1) Online: Go to www.us.coopertire.com/promotions. Follow the directions to enter in your name and address and upload your receipt. This is the name that will appear on your Cooper Tires Visa® Prepaid Card or your Cooper Tires Prepaid Mastercard® Virtual Account. (2) Mail: Complete the mail-in form. Please print clearly in large capital letters. This is the name that will appear on your Visa prepaid card or your Prepaid Mastercard Virtual Account. Include the original dated sales receipt. All sales receipts, regardless of your submission method, must show the qualifying Cooper tires, purchase price, and tire size. Work orders will not be accepted. Circle the tires and size purchased, which must be one set of four of the qualifying Cooper tires. Substitutions are not eligible. Please do not use staples when sending your information. Please mail to: Cooper Tire “Spring” Reward, Offer # 19-65701, P.O. Box 540012, El Paso, TX. 88554-0012. No reward will be issued for requests that are not properly submitted. 8. Keep copies of all documents for your records, as well as a record of the date your reward request was submitted. All submitted documents will become the property of Sponsor and will not be returned. Please allow 6 to 8 weeks after Sponsor receives the request for the delivery of your Visa prepaid card or Prepaid Mastercard Virtual Account. If card/ virtual account is not received within 8 weeks, contact a Sponsor representative by calling (833) 396-8074. You must notify Sponsor of any claim of non-delivery of your Visa prepaid card or Prepaid Mastercard Virtual Account no later than August 15, 2019. Claims of “lost materials” will not be honored unless accompanied by proof of receipt of materials by Sponsor, such as proof of certified mailing. If you claim a reward was not delivered or was improperly denied, you will be required to furnish Sponsor with a copy of all materials you submitted for verification. 9. Incomplete requests will delay processing. If any request is submitted by the deadline but is incomplete, Sponsor's representative will notify the sender by mail or email, and you must resubmit the request with all missing information within 10 days of receipt of such notice, together with a copy of the notice. 10. All decisions made by Sponsor (or its authorized representatives) relating to the validity of any submissions are final and binding. 12. Sponsor reserves the right, in its sole discretion, to withdraw or amend this offer in any way, or to amend these terms and conditions without prior notice or obligation, in the event of: (i) any error, technical problem, fraud, or any other cause beyond the reasonable control of Sponsor that interferes with the proper conduct of this offer as contemplated by these terms and conditions; and/or (ii) any accident, printing, administrative or other error of any kind. 13. In the event of any discrepancy or inconsistency between these terms and conditions and any statements contained in any reward-related materials, including but not limited to the entry form, or point-of-sale, television, print, or online advertising, these terms and conditions shall prevail, govern, and control. 14. The offer is governed by, and these terms and conditions will be construed and interpreted pursuant to, the laws of the State of Ohio, without regard to conflicts of law rules that may require the application of the laws of another jurisdiction. Furthermore, by entering this offer, you agree that any and all disputes, claims, and causes of action arising out of or connected with this offer, or any prizes awarded, shall be resolved individually, without resort to any form of class action, and exclusively by the United States District Court or the appropriate Ohio State Court located in Hancock County, Ohio. 15. If you have questions about this offer, contact Sponsor by calling (833) 396-8074. Sign up for our mailing list to receive special offers! Quality products from Bridgestone, Firestone and Fuzion and great service is what sets Portage Tire & Auto Service apart from the rest. Our service department specializes in alignment, shocks and struts and brake service for customers just like you.